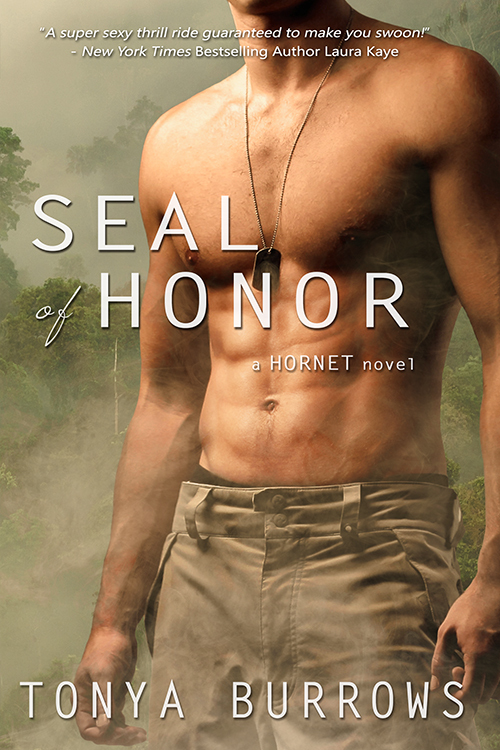 SEAL of Honor is the first book in Tonya Burrow's new romantic suspense series focusing on a private hostage negotiation and rescue team called HORNET. They are a newly formed team of ex-military / special forces / police officers and this is the first case they are working together. Gabe is the man in charge and the one who has to try and get his ragtag group to work with each other rather than against each other. The men are testing him, trying to see how far they can push him and what they can get away with which I have to admit was quite amusing to watch. It doesn't take too long for Gabe and his second in command Quinn to whip them into shape though and I'm looking forward to getting to know each of these quirky characters better as we get to read all of their stories throughout the series. This first instalment is Gabe's book though and he makes for a fabulous hero. He was medically retired from his SEAL team after a serious car accident nearly cost him his leg. He has worked hard to regain the use of his leg but it causes him a lot of pain and he isn't mobile enough to remain on active duty. The last thing he wanted was a desk job though so when Quinn suggested working together to set up a hostage rescue team he jumped at the chance to be doing something more active. Their first case is to investigate the disappearance of Bryson, an American business man who was captured in Colombia. His kidnappers have requested a huge fee for his release but it is HORNET's job to bring him home safely before the insurance company have to pay out the ransom money. Things are complicated by the arrival of Bryson's sister Audrey who is determined to play a part in bringing him home. Audrey is a free spirit and the kind of woman who doesn't need money to be happy, she's an artist who likes the simple life and just wants to do her own thing. She loves her brother dearly even though he drives her crazy with his overprotective ways and as soon as she realises he is in trouble she drops everything to search for him. She has a huge sense of adventure and doesn't think twice about putting herself in harm's way if she thinks it will help Bryson, something that drives Gabe and his protective instincts crazy! When the two of them go on what should be a simple task to collect a witness statement they soon find themselves up to their ears in trouble. They will have to rely on each other until the rest of the team is able to track them down to help them. I really enjoyed watching the fireworks between Gabe and Audrey, in a lot of ways they are complete opposites and they are quite good at pressing each other's buttons which made for some fun banter but also a lot of heat. As a romantic suspense SEAL of Honor does focus heavily on the action and there are some great fast paced action scenes that had me on the edge of my seat. I loved the fact there is a solid storyline and always plenty going on but there is still enough focus on the romance to make it intense and believable. Gabe and Audrey make a great couple and I'm hoping we'll see more of them both together as the series continues. Another major part of this story is the introduction of the rest of the team, they really are a great bunch of guys and I can't quite decide who I think is going to be my favourite. I'm looking forward to getting to know them all better and seeing them bond as a team as they spend more time working together. Thanks for sharing I am looking forward to reading about The Hornets. impressive book cover!! haha! good looking! haven't read it but it's definitely been on my list! @ Corn Dena - It was definitely the cover that first caught my attention too LOL. The story was great too though!